Thailand’s sunny islands and sandy beaches are known to be some of the most beautiful in the world. But if lazing around on stunning beaches isn’t your thing, fret not because there is something for every couple. Next to the beautiful Andaman sea, Phuket, Thailand has appeared in many a travel brochure and is one of the largest out of the top few quintessential must-visit islands filled with picture-perfect scenery and a rich culture inspired by a long and interesting history. Remove all the hassle of planning the perfect holiday trip with this guide and better spend the energy preparing for the quintessential romantic journey. Kick off your shoes and spend some quality time with your loved one in this equatorial paradise. For couples who are craving for the simple pleasures of island life and itching for a romantic getaway, Phuket offers serenity, indulgence, and romance for every vacationing couple. So if you’re planning on surprising your significant other with an island getaway, definitely put Phuket on your list. Inspired but hate the process of travel planning? Find out all you need to know to plan a romantic 5-day Phuket Trip down below! Travel duration - Why a 5 day trip is perfect. You will find yourself starved for time with a 3 - 4 day trip, and a week is far too long. A 5D4N trip fits perfectly, with enough time to enjoy all the activities without getting jaded. If you’re working, we’ll recommend taking 3 days off. Fly off on Wednesday, count in 2 days from the weekend, and you’re all set for the mini-honeymoon you’ve been dreaming of! Accommodation - where should we stay in Phuket? For the party-goers, the town of Patong is the hub for exciting nightlife and tourist shopping on Phuket. It’s also where the majority of hotels are located. However, as taxi and tuk tuk prices are inflated for tourists here, it is pertinent that you select a hotel that is nearest to places you intend to visit. For some peace and quiet and generally more chill vibes, find the most beautiful luxury resorts, sweeping bays, beach clubs, restaurants within the chic enclaves of Surin and Kamala. Check out our recommended best hotels for couples in Phuket to find the perfect accommodation for the best holiday. Read on to check out our recommendation for unique places to stay at. If you and your partner love nature as much as you love each other, hug a tree (and each other) at the nature-inspired, fully-integrated Laguna Resort which boasts one of the most lovely wedding chapels in all of Asia! If you do not mind splurging, pamper yourself and your partner with the total privacy of a pool villa at Sala Phuket, or watch the sun set over the horizon from one of Trisara Phuket’s infinity pool that faces the ocean. Be sure to check out our Top 10 Private Pool Villas In Phuket for under 105 USD. Activities - what is there to do in Phuket? Enjoy the gorgeous scenery and gentle sea breeze as you glide along the magical giant limestone cliffs of Phang Nga Bay aboard a traditional Chinese Junk. Be in the moment with your significant other as you explore and admire the many caves and lagoons similar to the famous Halong Bay in Vietnam. 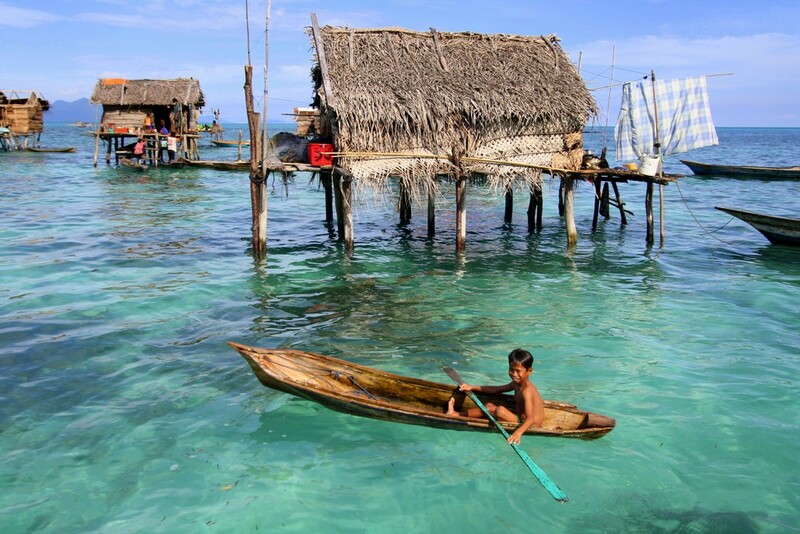 Make sure to stop by the Sea Gypsy village for an interesting cultural experience with the nomadic colony of Moken (people of the sea) who are said to be the first inhabitants of Phuket. What’s better than going for a spa pampering session? Enjoying it with your beloved of course! (unless he/she snores) Many hotels and resorts will offer this service. After the both of you are all rubbed out and feeling more flexible, head back to your hotel room for some more relaxation. 3. For those who have already put a ring on it or are intending to, renew or say your vows with a Thai wedding! Thailand’s many islands and resorts specialise in destination weddings and honeymoons. If you are staying at Laguna Phuket or Kata Thani, you can ask the concierge to arrange a Thai Wedding Ceremony for you. Depending on you and your fiancé/fiancée’s preferences, it can range from a simple ceremony with blessings from Thai monks, to a full scale wedding party with dinner by the sea, photographer and a live band. Everything will be taken care of for you, and all you need to do is say “I do!”. 4. Go snorkelling / scuba diving! For those who are PADI certified, go diving together! Don’t just admire the Andaman Sea from its surface, discover and explore its underwater realm! If you have yet to get your PADI certification but want to dive, Phuket’s dive centre can offer a ‘Discover Scuba Diving’ crash course. Racha Island has clear blue waters and vibrant marine life. If you already have your licence and can afford to get a good live-aboard cruise, some large boats have large private cabins with comfy big beds! Hate crowds? Believe it or not, here in Phuket, you can actually have an entire stretch of beach to yourself! Mai Khao Beach is an 11 km (6.8 miles) long deserted beach that is part of a National Park. You won’t see a soul on the beach all the way from Haad Sai Kaew at the very north of the island to Nai Yang Beach all the way south. So get your picnic mat out, catch the sunrise/sunset – it’s the perfect setting for whispering sweet nothings to your lover. For more activities to add to your itinerary, here are 15 most romantic things to do in Phuket. Dining - what is there to eat in Phuket? 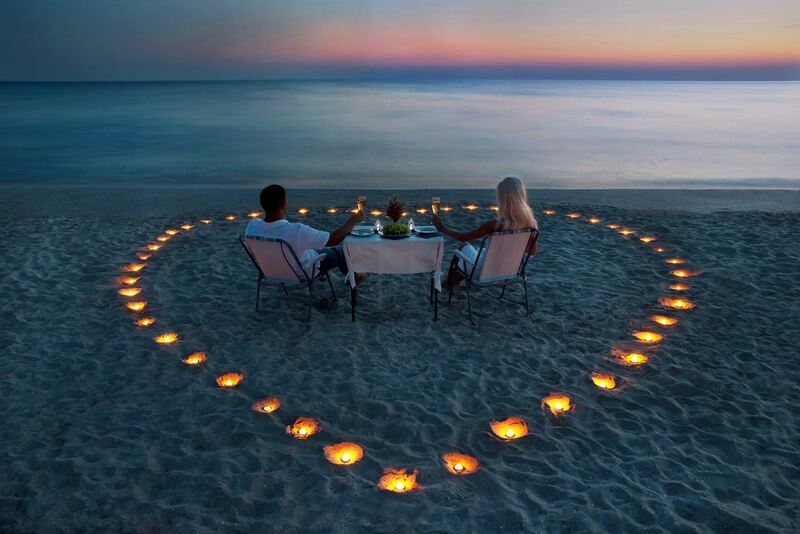 A romantic dinner by the seashore? That’s the ultimate experience. If there’s one thing Phuket has, it is romantic restaurants. The craggy coastline is dotted with picturesque bays, coves, and several award-winning restaurants with views that will scream romance. Set on beachside cliffs and with sensational sunset views, Diavolo Restaurant in Paresa Resort (Kamala Beach) or Mom Tri’s Kitchen in Kata Noi provide the idyllic setting for romantic dining, or for that perfect sunset cocktail. Casuarina at Dusit Thani Laguna Phuket and Boathouse are the go-to restaurants for beachside dining. With so many romantic dining options to choose from, we present you our 10 Most Romantic restaurants in Phuket to impress your loved one. Budget: how much will we spend? On a romantic trip, even if your partner is practical and frugal, there are still bound to be certain costs that you can’t scrooge on. Fortunately, everything in Phuket is priced very affordably. Food and transport will not set you back too much, leaving you free to splurge on unique experiences and luxurious accommodation. People who have been to Phuket before quote an average of 100 USD-150 USD a day, which will amount to 500 USD-750 USD for a 5 day trip (excluding flight and accommodation). Thai people are known to be some of the most hospitable in the world and will go to great lengths to ensure you and your partner experience the romantic trip of a lifetime! For the foodie-couple, just the food on its own already warrants a trip to the land of smiles. Whether you’re just dating, just married, or just celebrating a special anniversary, a romantic escapade to Phuket is sure to have you falling in love all over again. Ready, set, jet to Phuket!